Custom Coffee Sleeves to Promote Your Brand! HotShot Coffee Sleeves is the premier printer of custom coffee sleeves for cafes, restaurants, and marketers. 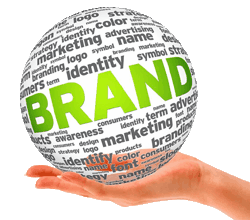 In today’s competitive market, smart branding strategies are crucial to the success of any business. Custom cup sleeves are a great way to promote your visual brand and build a solid base of loyal customers. Stand out from the crowd and promote with high quality coffee cup sleeves. 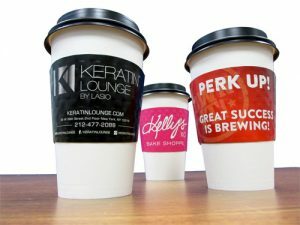 Customized Coffee Cup Sleeves Puts Your Brand in Their Hand! Time and time again, we hear how coffee houses would love to have their branded coffee sleeves, however, high costs and high minimum orders for custom printed sleeves have made this feat difficult. It is our goal to change this and get your message in front of coffee lovers! We offer a variety of options regarding color printing and quantity requirements that offer start-ups and low volume users the opportunity to have their very own custom coffee sleeves. Start small and order as few as 1250 simple black and white sleeves, or begin big and go for our premium full color cup sleeves. Either way, we've got you covered! All of our hot cup sleeves are made from 100% recycled paper, so you can trust us for an eco friendly alternative to visual marketing on hot cups. 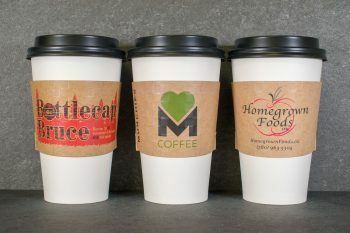 In addition we offer sleeves for paper coffee cup sizes including 8oz, 12oz, 16oz and 20oz. 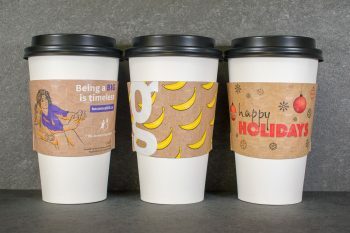 Branded Custom Coffee Sleeves Are a Great Marketing Opportunity for All Businesses! Sleeves aren't just for cafes and restaurants. We have printed millions of branded cup sleeves for businesses unrelated to the hospitality industry. A HotShot custom coffee sleeve allows your creative team the ability to use full color, full-bleed graphics in creating a unique branding experience. Personalized sleeves as a cup holder are great at trade shows and marketing events. Partner with your local coffee houses by providing them with your branded cup sleeve to build local brand awareness or to introduce new products, services or gift cards. Take it one step further and be really creative with a scratch and win game. If you can dream it, we can most likely produce it! Design a coffee sleeve to suit your needs. At HotShot Coffee Sleeves, we’re dedicated to providing you with the most helpful and cost-effective products and solutions, which is why we offer a number of specialty services to make sure you’re as satisfied with us as possible. If you’re working on a time constraint, we can get your customized coffee sleeves in your hands in as little as 7 business days. Whether your order is as small as 1250 or as large as 500,000, we have the resources to suit your needs. With HotShot Coffee Sleeves, you’re not only getting a customized high-quality product, but we’ll also make sure that it meets all of your specifications. Finding new and interesting ways to market your brand can be a challenge. At HotShot we’re dedicated to making it easier than ever for you to display your unique visual brand on custom-made coffee sleeves. 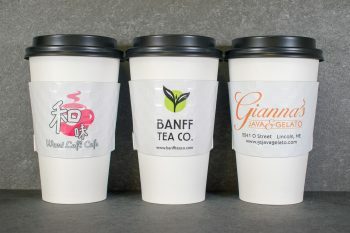 Our coffee cup sleeve designs are not only great for local cafes, they can also be used to promote your company at trade shows, outdoor fairs, and other marketing events. With standard and full-color graphic options available, you can get the custom coffee sleeves you want at a price you can afford. We also have rush order services available if you need your custom sleeves for an upcoming event or promotion. For more information and to start designing your personalized custom sleeves today, contact us at HotShot Coffee Sleeves.